With our long ago planned outing thoroughly drowned in a week’s worth of forecasted Oregonian rain, we decided on an alternative eleventh hour fallback option and hit the super slab toward California’s Sierra Nevada for two weeks of RV camping. We arrived at our creek side campsite in late afternoon. Situated beneath tall timber with granite outcrops, well separated from other sites and on the bank beside the creek, it was the best spot in the entire campground. There was even a small pool in the creek right below the campsite perfect for the kids to play in. Though the pool immediately caught my eye as being a prime trout hole, its proximity to a popular campground, right off a paved highway leading to world renown tourist traps, put any hope of hooking fish out of mind. The spot had been heavily fished for decades. Trout that happened to find themselves therein on any particular season had no doubt been routinely bombarded by every lure and bait known to mankind. I was sure that if on the off chance there were fish in the pool they’d ignore anything I threw at ’em. Shortly before sundown we ventured down to the creek to take a looksee around and I was astonished to see several trout holding in the pool. Not minnows, but fair sized fish. They measured some eight to ten inches or so and sent me scrambling to retrieve my rod and reel. It was a perfect opportunity for my daughter to catch her first fish. But one clumsy cast confirmed my previous pessimism, as the trout darted away as soon as my line hit the water. My wife giggled at my inept attempt. The world’s most powerful brain, human, defeated by a fish brain the size of the tiniest pebble. I was left standing on the bank feeling like an idiot. The next day, late afternoon, I’m considering giving the trout pool another try when I see two rather portly guys down there hobbling around on the cobblestones gracelessly tossing their lines in. I’m instantly irritated. I mosey down toward the water with my daughter, acting indifferent and pretending not to be interested in their fishing, when I’m thrown into a mental tail spin and my afternoon is thoroughly spoiled. I see one of the guys hoist a stringer from the stream loaded with dangling trout. Having been pessimistic about my chances of catching a fish, I had put in a halfhearted attempt the previous day and prematurely written off the spot. Just a few sloppy casts with one lure and then a pathetically tied bait rig for my daughter to play with. Seeing two dudes apparently pulling out trout at will sent me stomping back to camp in a foul mood, angry with myself for not having given the pool a serious try. My daughter asking why two guys were catching all our fish, and further innocent comments about how we’re not good fisherman, didn’t help. Keeping an eye on the two guys from our camp, I watch them leave and then walk down to the water to see if they did indeed catch all the trout we had seen. It was bad enough that I blew my chance, that these two guys showed up and raided the hole right in front of me. But when I walk up to the edge of the stream I see cigarette butts gleaming white against the darkened wet sand. The pool had been plundered not by some skilled angler or woodsmen I might be able to respect, but two slobs with no consideration for anybody or anything else. Our pristine little pool below camp was now strewn with cigarette butts and wads of guts from recently cleaned fish. Sulking around camp, I decided to take a walk up the creek to check out the small bridge where the road crosses, thinking there might be a pool below it. On the way up the stream with my daughter, walking sloppily and being preoccupied, I slipped on the rocks and stepped into the chilly water twice, which further aggravated my already irascible mood. With less than an hour of light left I had two cold wet feet, cigarette butts and trout entrails but no fish. There was no pool beneath the bridge. The water flowed under the two lane overpass and tumbled down over a section of small jagged rocks and into a large puddle, which, while some twenty feet across, measured only about six or eight inches deep at most. The downstream side of the puddle was walled off by another berm of small jagged rocks, which the water flowed through like a sieve. As we stood at the edge of the shallow, gravelly puddle we had hoped was a deep pool, my eagle-eyed daughter, who over the course of our trip would spot nearly every notable wild animal we saw, shouted excitedly as she spotted a trout swimming by in just several inches of water. I couldn’t believe it. Then, with even greater excitement, I realized the fish was trapped. The creek under the bridge is cemented over. When trout swim or get washed downstream over the cement chute under the bridge they can’t swim back upstream. The fish can’t escape the shallow puddle by swimming downstream either because of the berm of small jagged rocks. The creek works remarkably well as a natural fish trap. An eleven inch ugly snatched by hand. In the middle of the puddle there was a small boulder just big enough to stand on. When I chased the trout into the shallows trying to catch it the fish darted under the boulder and hid. I made my way out onto the boulder, and as I knelt down and peered over its edge, I saw several trout tails fluttering back and forth in the gentle current. With only inches of open, slow-flowing water in the puddle, the single boulder was the only shelter the trout had and it had attracted a hand full of them. Crouching on the boulder, I slowly dipped each hand into the water and slid them into a surprisingly deep cavity under the rock. I could feel several fish slithering around. Blindly grasping, slowly, gently, I carefully felt out the largest fish, clenched tightly onto it and ripped it from the water triumphantly holding it aloft. What better way to fortify my flagging masculinity? If only I’d had a loin cloth on and been bare chested with a big Grizzly Adams beard! My daughter erupted into a fit of squeals and screams and cheered me on to catch more. I snapped a thin green branch from a nearby tree, bent it in half into a v-shape and slide one end through the trout’s gill plate and out its mouth for a makeshift stringer, before going back to the boulder for another try. Too young to understand the trout was dead, and not having seen me knock it out on a rock, my daughter promised to dutifully watch our one glorious fish so it didn’t swim away. 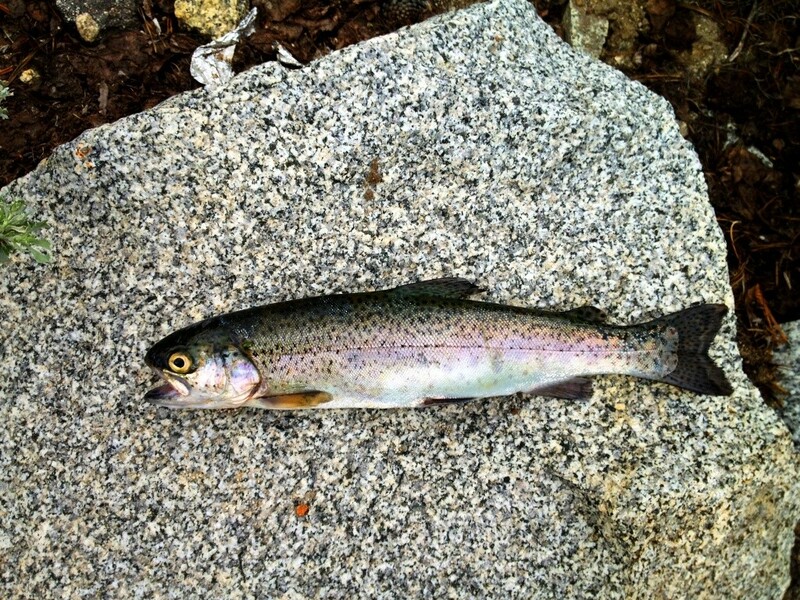 It turned out there were six trout under the rock. I managed to grab five, three of which I kept, the other two I let free in the creek below the trap. I had never caught a fish by hand. “Just like a bear,” my daughter noted. What had begun as an extremely disappointing afternoon ended triumphly. It was a surprisingly unexpected chance experience, which far exceeded any excitement we may have had in catching the fish below camp with a plain rod and reel. One never knows when luck is going to swing dramatically in their favor. 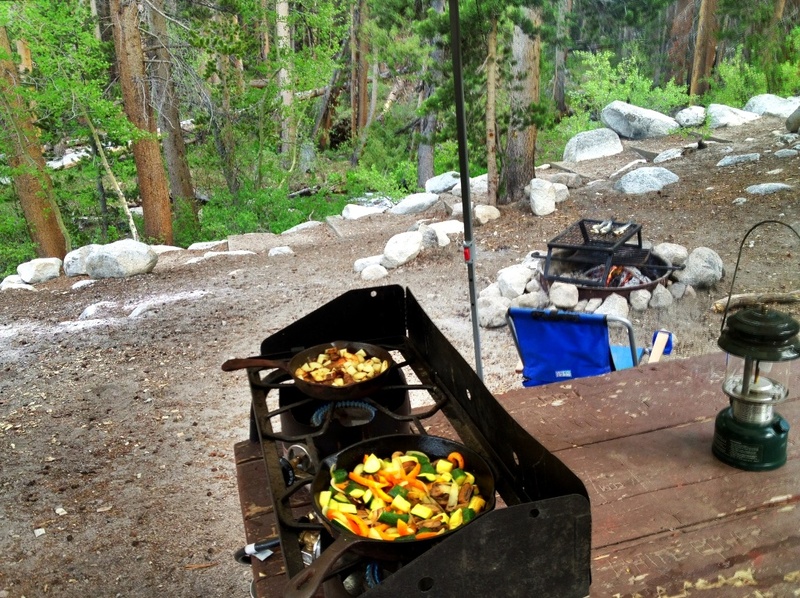 Camp beside the creek, fresh caught trout roasting on the grill over oak, and on the stove sauteed vegetables sizzling their way toward caramelization and fried potatoes gettin’ crispy. This entry was posted in Sierra and tagged Backpacking, Camping, Fishing, Hiking, iPhoneography, Nature, Photos, Pics, Sierra Nevada, Trout, Wildlife, Writing. Bookmark the permalink. Hey Richard. Enjoy your time in the mountains! Congratulations Jack, nice fish story! I just got back from Eastern Sierra this afternoon, visiting lots of landmark places, including the hikes to Devil’s Postpile and Rainbow Falls. Our last stop was Parchers Resort before heading home.